Take Care Of Your Garbage Disposal And It Will Take Care Of You. Garbage disposals take a major beating from day to day. They often get the impression that they can ground up anything and push it safely down your drain, but that is not the case. 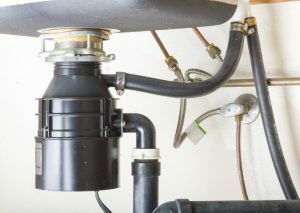 In order to avoid a garbage disposal repair, you will need to be cautious about the things you are throwing down there. A garbage disposals main job is to help push a buildup of water and small amounts of food, down your drain. It is not to act as a grinder for everything that you could need to disappear. If your disposal is starting to act up, you first want to make sure that there is nothing stuck inside of it. Sometimes, something may have gotten wedged underneath it and stopped it from moving and other times, the motor may have just burned out. A garbage disposal repair is usually done pretty quickly because we will be able to determine if it needs to be repaired or replaced. When you do need a garbage disposal repair in Mills River, Hendersonville, and Asheville, NC, make sure you call All About Plumbing & Septic at 828-778-2425. We have a team of professional plumbers that deal with garbage disposal issues all of the time. We are always happy to help answer questions and give you tips for what to do if something gets stuck in there or it stops working. We can also do garbage disposal installation for you if you decide you want to get a new one or something that is bigger. Read below on what not to put down your disposal so that you will be aware of the dangers of clogging your pipes and help avoid expensive services like hydro jetting. Let us help you with all of your plumbing needs and remember that we are available to you 24 hours a day! Give us a call and let our professionals at All About Plumbing & Septic help you, today. Pasta: When pasta is put into water, it will begin to expand. If you end up with a lot of pasta going down your drain it will continue to expand and form a clog in your pipes under your sink. Even if the garbage disposal cuts it up, it will sit in water and continue to expand until it is either washed away or forms a clog. Coffee Grounds: So many people put coffee grounds down their sinks, not even realizing what it is actually doing to their pipes. Coffee grounds do have the ability to get rid of odor in your drains, but the damage that it can end up doing is far worse than the smell will ever be. The problem with coffee grounds is that they will form together to create a sticky paste that will clog up your drain lines and have to have a hydro-jetting service to get all the way out. Egg Shells: Contrary to popular belief, eggshells will not sharpen the blades of your garbage disposal. These shells actually have little layers of membrane that are inside and will get caught in your pipes and cause clogs just like onions will for the same reason. You can throw your old egg shells in the trash or you can use them in your backyard or garden to decompose naturally. Potato Peels: The biggest problem with potato peels is that they are usually put down the drain in abundance. That means that they will all go down the drain around the same time and your garbage disposal will be overloaded and may even stop working. If for whatever reason it does make it past the blade, it can very easily get clogged up in your drains. Taking Care of Your Garbage Disposal Prevents Having a Broken Kitchen Sink! Chemicals: You need to be careful with the type of chemicals that you are putting down your drain. Some of these can be extremely harsh. They are made to help dissolve the clogs with strong chemicals, but what do you think that is doing to your actual drain? The best thing you can do is to ask your plumber first to make sure that it can be used safely or what they would recommend. Trash: When we say trash, we are referring to anything that does not decompose. Never ever put plastic, paper, cloth, or even banana peels, down your garbage disposal. It was not made to be able to handle these types of things. Your best bet would be to avoid throwing anything major down your sink, just use your trash can. If you end up needing a garbage disposal repair in Mills River, Hendersonville, and Asheville, NC, call us at 828-778-2425, and we can schedule an appointment at a time that is convenient for you. Updated on January 22, 2019 at 12:51 pm by All About Plumbing.